After Siem Reap on the first leg of my Southeast Asia trip, my next hop was to Bangkok. Just like the next two stopovers (Koh Samui and Phuket) it was a flight on Bangkok Air, which has the best economy class of all airlines I’ve ever flown. They dub it a boutique airline for a good reason–even though all my flights were under an hour, we were served an in-flight meal. They also have a lounge at Bangkok Airport that is available to coach passengers with snacks and Wi-Fi. Very few people know they are entitled to access the lounge on an economy ticket. 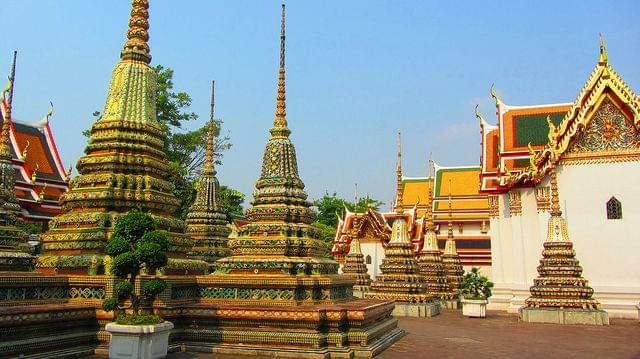 Bangkok is a fantastic city, a perfect mix of history and modernity, unbelievable shopping, incredible food and nightlife. With something for everyone, I can’t imagine that anyone would be bored there. 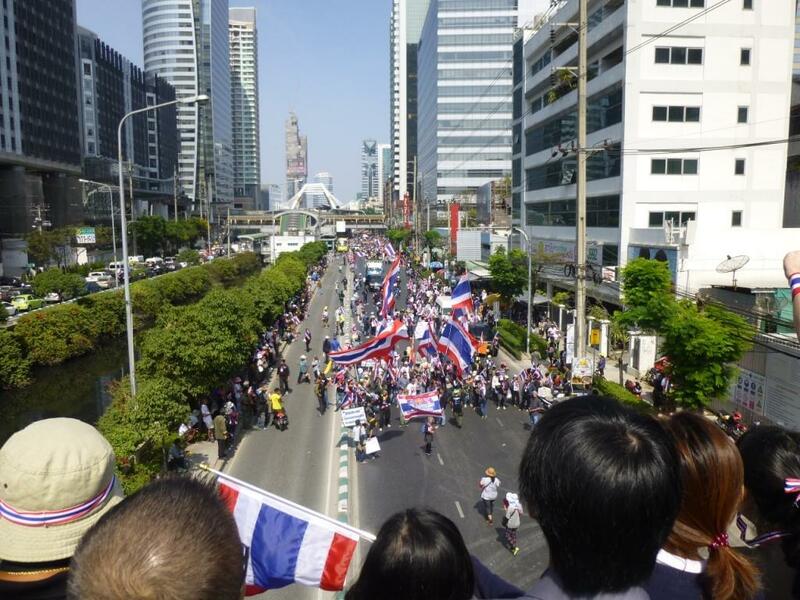 I visited during the recent anti-government protests, and despite the unrest the city was flooded with tourists. Bangkok is incredibly visitor-friendly. There are plenty of signs in English wherever you go and announcements on buses and subways are in English. Bangkok is also unbelievably cheap, despite being a tourist mecca. A four- or five-star hotel can run you under $100, and if you want to use points, then almost every hotel chain in the world from budget to luxury can be found there. A good meal at a local restaurant can cost you around $5 to $10, and that’s with a drink. A lavish dinner at a world-class establishment that would be worth hundreds of dollars stateside will cost under $100 for two. Tickets to attractions are $3 to $5. Taxis are dirt cheap, too, but make sure they turn on the meter. Bangkok Air is not a budget airline. The three flights between Siem Reap, Bangkok, Koh Samui, and Phuket cost me more than $500, and each flight was only about one hour. But a year ago, I applied for and received a 33,000-point bonus from a US Bank FlexPerks credit card, so that eased the pain a bit. The current sign-up offer is 20,000 points. These points can be redeemed for any airfare at 1:2 ratio, so my $500+ ticket cost me less than 30,000 points. There also is a 20,000-point sign-on offer from Japan Airlines if you want to use their miles on partner Bangkok Airways. It’s good until December 2014. You will still need to pay taxes on these flights. The roundtrip distance between Siem Reap and Bangkok is mere 434 miles, so your whole trip would fit well within 5,000 JAL miles if you choose this option. But how do you get JAL miles in the first place? Japan Airlines is a partner with the Starwood Preferred Guest Program. You can transfer your points from SPG to JAL Mileage Bank at 1:1 ratio. If you transfer more than 20,000 points, then it becomes 1:1.25 ratio. Basically, you can get your roundtrip flight between Siem Reap and Bangkok for 5,000 SPG points. That’s a true bargain for this short, but quite expensive, route. If you don’t have SPG points, there are two credit cards that will give you a jump start: Amex SPG Personal and Amex SPG Business. While personal version offers 75,000-point bonus after meeting a $3,000 spending requirement within 3 months, business one will give you 100,000-point bonus after spending $5,000 within 3 months. There are a few caveats to this promo. The transfer is not instantaneous, and the terms of the promotion require you to begin and end your trip in the same country. Also, JAL does not allow one-way travel. It’s roundtrip only, so the best way to use the promotion would be to call JAL to confirm availability for the dates you want. Then you would complete the transfer and cross your fingers that your dates remain available when your miles hit JAL Mileage Bank. You would have to be reasonably flexible and plan well ahead to make this work. Of course, before you do any of this you’ll need to register for JAL Mileage Bank. Its completely free, and you can do it here.